Play alone or with friends to battle against the Fallen One for honor and victory. Conceived and designed by three Magic: The Gathering tournament players, Ascension will provide hours of engaging and strategic game play for enthusiast and experienced gamers alike. 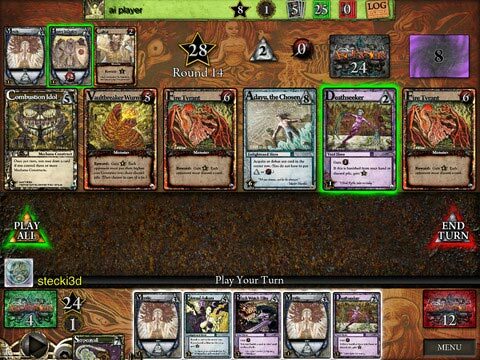 Short Overview of Gameplay -> It’s a deck building game, where the goal is to gain victory points by killing monsters or buying cards with VPs associated with them. So you might buy a card that gives you more Runes (money), or Power (Heavy Militia). 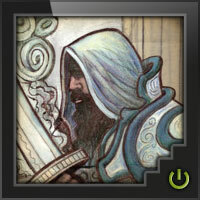 Then depending on what you draw to your hand, you can buy other cards with special abilities. Or, if you have enough power, you can choose to defeat a monster. On the translation -> Well done. The art looks good, the game play is smooth, and you have the ability to speed up or slow down game play. The game makes it clear if you can’t do anything else on your turn, which is helpful (especially as you are learning the game). A couple nits on the interface: Dragging to the void (when you defeat monsters) or adding to your discard (when you buy cards) is a little touchy. You have to ‘throw’ the cards, and if you don’t get them to just the right area it doesn’t work. Like I said, a nit. The other thing that is a tad bothersome is that when you have constructs in play (they are always active, you don’t have to draw them), it is difficult to remember you have them to act upon. There is for instance, a card that allows you to draw an extra card to your hand. I always forget to do that before I start buying\fighting. Then I notice after I played my hand, and I’m irritated. Overall – I would definitely recommend a pickup of this game. I bought it for $.99 and immediately bought the expansion. Great quick gameplay. I love Ascension. As the game that started my collection, I fell hard for its simple yet strategic style of play. I’m always up for a game if anyone is interested. It doesn’t make it out to the table very often anymore, though, due to the ever expanding number of new games that have been added to the collection over time. The iOS version is perfect for me, because now I can play anytime I want with people from all over. It’s fairly up to date on expansions as well, only missing the latest standalone Rise of Vigil and its expansion. If you like Ascension at all, you’ve got no excuses. Get the iOS version. *NOTE* I reviewed the components as 1 star because, well, there are none. Unless you count your phone as a component, but that would make you a weirdo. I learned to play from a friend at a local hobby store. The game was easy to pick up as I play games like MTG, L5R, ARC, Etc. I found myself instantly enjoying Ascension as I really enjoy drafting in MTG. The game was easy to learn and on IOS it’s even easier! It helps you along and the pace is very fast. I soon taught my girlfriend how to play in hopes it would be a gateway drug/game to more addictive and ultra dorky games lol. Instead of moving to other games we just keep playing Ascension! The each player takes their own turn allows the game to play similar to Words With Friends on IOS, which is very convenient if you’re not able to sit and play for 10-15 minutes without stopping. If you can play for 10-15 minutes without stopping it goes by quick and you can sometimes get 2-3 full games in within that amount of time. The physical card game is loads of fun as well. Although it’s a bit slower paced and not as convenient as the IOS, it is still a blast. In fact, my only beef is the artwork. The artwork is different and cool, but the game could be SO MUCH MORE COOL if the artwork was better. I highly recommend picking this game up as well as its expansions, you wont be disappointed. 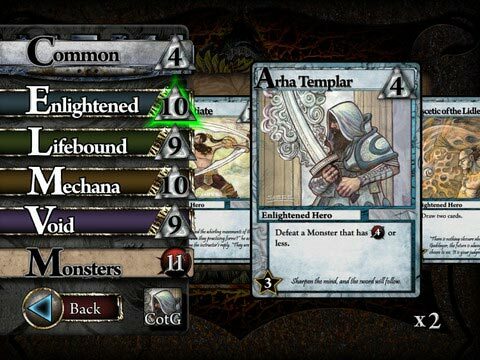 I became a fan of Ascension even before the card game came out. The art style intrigued me and I was looking forward to playing a game where I did not have to collect the cards in order to be able to play and enjoy the game. When I finally got my hands on the physical game, I was very happy of the outcome. The game is a great deck building game with a shorter setup and put away time. Then the app came out and it was a no brainer for me to get it. This allowed me to play against my wife without having to set up cards and put away the cards. To my surprise, this game plays great online. The asynchronous play works perfectly for those on the go. If you are looking for a deck building game or have never played a deck building game before, definitely check this game out. One of the best Card Game Apps in the App Store. I enjoy the game, but it seems to require more luck than skill. 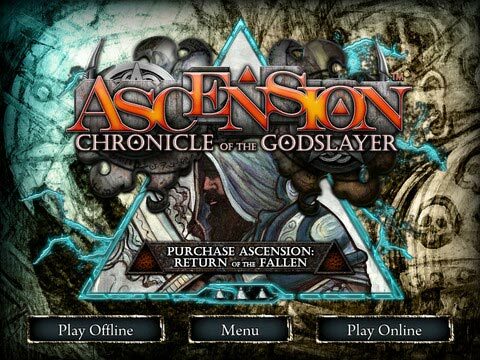 Add a Review for "Ascension: Chronicle of the Godslayer"